Having never dined at a Magic Kingdom table service restaurant, I figured it was time to check one out. After reading the great reviews about the lunch that was served at Liberty Tree Tavern, I thought I would “take one for the team” and check out dinner. 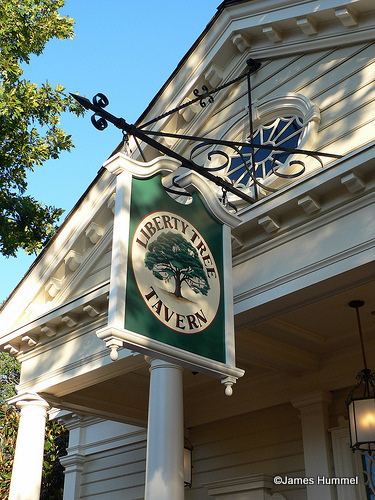 As with the rest of Liberty Square, the Liberty Tree Tavern looks like a stereotypical 18th century American Revolutionary War period establishment. Guests are welcomed into an open common area with a large fire place/cooking area. 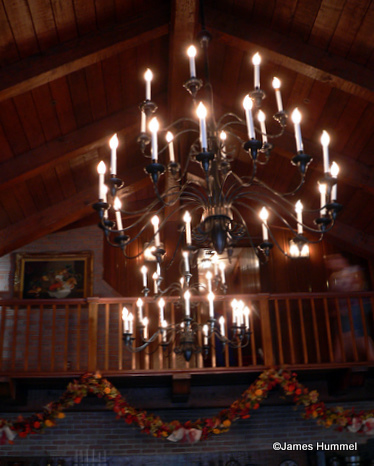 The room was decorated with an autumn theme when we were there. 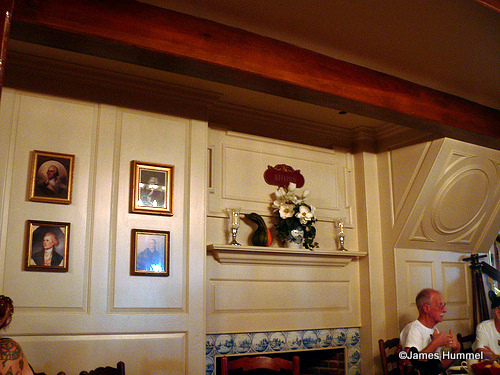 While I’m used to a certain level of noise at Walt Disney World, Liberty Tree Tavern seemed rather loud. Granted, my 2 year old son had no trouble adding to the noise level. There seemed to be a rather large number of birthdays going on, as there was singing going on every 5-10 minutes. The menu is a set menu for dinner, served family style, all-you-care-to-eat. We were brought out sweet rolls with whipped honey butter to start. I found the rolls to be a little stale, but my son found the whipped butter interesting and wanted to eat it right out of the bowl. 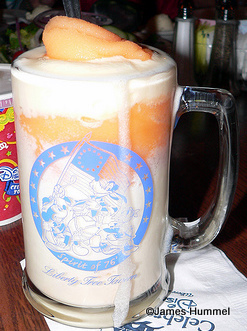 Since there is no alcohol served at the Magic Kingdom, I opted for the Patriot’s Punch. It was a great frozen drink, much like a smoothie. Although the menu said it included the Collector’s Mug, I was never billed the right price and never got to take one home. 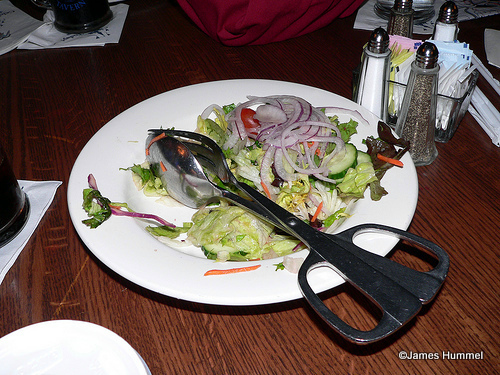 Next up was a tossed salad with a strawberry (could have sworn it was raspberry) vinaigrette. The salad was OK. Pretty standard fare. 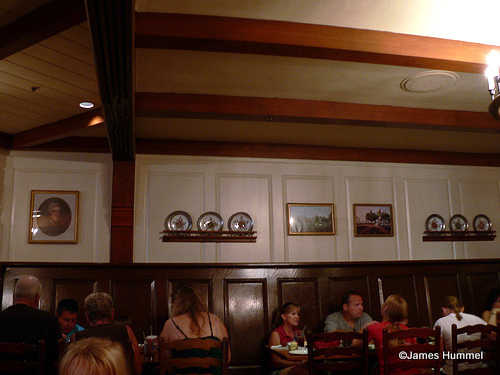 The main course is where Liberty Tree Tavern shines. Dinner includes a meat plate with turkey (white meat only) and dressing, smoked pork loin (more liked glazed ham) with an apple sauce, and flank steak (served medium). 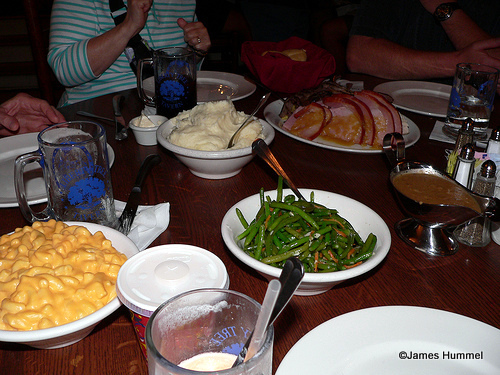 We were also served mashed potatoes (my favourite), green beans in a garlic seasoning, mac and cheese (huge hit with the kids) and gravy to smother it all. Mmmmm, turkey and all the fixins -- Grandma, don’t touch the food until the picture is taken! The meat plate was the star of dinner. 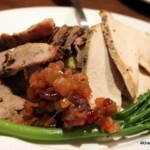 The turkey was tasty and the flank steak was very tender. We enjoyed the meat plate so much, we asked for more. The big surprise was the gravy. My brother-in-law thought it tasted like KFC gravy (at least here in Canada), and when poured over the mashed potatoes it became an amazing side dish. For dessert we had apple crumble with vanilla ice cream, which was a huge hit at the table. 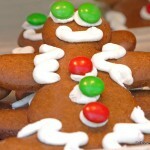 Personally, I could have had more turkey, steak and mashed potatoes with gravy for dessert. As usual, with Magic Kingdom restaurants, the surroundings are Disneyesque. You feel you are in a place such as Williamsburg. My problem with the food is not so much the quality but the fact that these are the type of foods I cook at home. On vacation, I like to try foods that I wouldn’t cook for my wife and I, or wouldn’t even think about. To me, vacation is about change from the usual routine, you know, “the Magic”. I have a question, so the food at the tavern is all you can eat? Like if your dish runs out you can request another one with no charge? Duy– yep! At dinner only, they’re all you can eat. 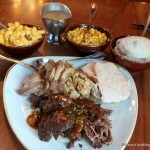 Although I’m a little late to the party, I feel the need to add – it is my all-time favorite Disney meal. Every trip to Disney has the required trip to LTT. I’ve been going for 10+ years. 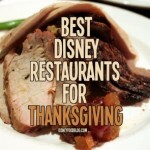 Although I miss the characters, I would not pass this stop for any other restaurant in “the world”!! I too am looking forward to dining at Libery Town Tavern. In all of my 35 years of visiting Disney, I have never even vetured into this area of the Magic Kingdom. I will be in Disney May 18th to 25th and would like to know if Kids under 3 eat for free here.